Matt black toolbox in a stylish design. Elegant tool box in matt powder-coated steel. Removable gold-coloured tote tray. Hinged handle and metal latches. Clas Ohlson was, in many ways, a unique person. A self-taught man with an open mind, always full of visions, inventions and ideas. He kept an eye on the outside world and both feet firmly on the ground in his small home village in the heart of Sweden. His business prospered thanks to simple but successful principles, built on common sense, technical skills, curiosity and a strong determination to develop smart solutions for everyday life. Clas Ohlson Signature Collection is a tribute to our founder. A series of smart and useful limited edition products with a bold design at great value. 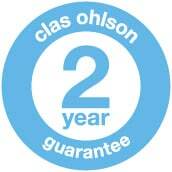 Designed and developed in Insjön, the place where Clas Ohlson once started his successful company a hundred years ago. Our Limited Edition products are available only in select stores, and there are a limited number of products. Please bear in mind that stock can run out quickly and the number of items available may not correspond exactly with the stock level shown on our website clasohlson.co.uk. To find out which stores sell the Limited Edition products, please go to the Offers tab.